For today’s post in our (very occasional) Home series, let’s talk about the best cookware and kitchen appliances. What is your favorite cookware to use? Is there any particular pan or kitchen device that you find you absolutely must have? Psst: Good job, ladies — after we last discussed the best sheets and the best towels, I’m now obsessed with Garnet Hill. I’m far from a Martha Stewart (like, really far), but if you’re curious from my perspective: When we got married, we got a bunch of fancy All-Clad Copper Core pots and pans. The first time I tried to use one (to saute shrimp and broccoli, if memory serves), I somehow burned the pan so badly that the oil splatters are still there. Around the same time, my MIL had gotten me a huge boxed set of cheaper non-stick Calphalon pans, which we proceeded to use into the ground. My understanding with nonstick/Teflon-coated pans is that at the first sign of wear, you should ditch them — so we’ve kept replacing them every year or two. I’ve been reading a ton about the benefits of cast iron, though, so we decided to try a pre-seasoned Lodge skillet for the first time recently… and I proceeded to burn the pan the first time making eggs. I’ve since watched the videos on the Lodge site and think I have the thing clean, but I’m still going to be really wary with cooking in it. So, to recap: the fancy wedding cookware looks great as kitchen decoration. The eco-friendly cookware is really heavy and I’m a little scared of it from a cleaning perspective. (Also: I can’t imagine cooking in it without a bucket of oil or butter, which isn’t usually my objective when cooking at home.) And I’ve just bought my third version of this nonstick pan. Other devices I love: my slow cooker, my old Magic Bullet (from the ’90s, I swear — it’s still going strong! ), my small George Forman grill (also from the ’90s!) and a toaster oven, which I have always thought is far superior to a regular toaster. I like the thermal carafe coffee maker we got recently(ish) from Macy’s (note, though, that I am not a coffee snob, perhaps best evidenced by the huge Folgers can sitting there). Two other things: I’m on a seltzer kick right now, so I’m loving our Penguin SodaStream, and for some reason I cannot get enough of Crate & Barrel dish towels — I’ve tried a few other kinds over the years and feel strongly that the C&B towels are the best from an absorbency/quick drying/non wrinkly/easy care/stylish/pretty perspective. Ladies, how about you — what have you stocked your kitchens with? What have you found to be the best cookware? Do you feel strongly about any of it? On the recommendation of other commenters here, I bought an Instant Pot about a month ago. Holy crap. I use it every day for breakfast (steel cut oats cooked while I shower & walk the dog!) and incorporate it in about half the dinners we plan each week, as either a rice cooker or a pressure cooker. I can’t wait to try out the slow cooking function. Thanks, ladies! And for serious, look into one if you haven’t already. I just received one of these as a gift and I’m excited to use it. But can you tell me how you got started? Did you just use the included materials or did you buy an additional cookbook? I can’t find a cookbook that gets good reviews. I use my Le Cruset dutch oven almost daily. I also just got a ceramic frying pan by Cuisinart at Home Goods and really love it. How do you clean your dutch oven?! I have read such conflicting information. TIA! I clean mine with soap and a scrubby sponge but every few uses I use either baking soda or Barkeeper’s Friend to clean any stains off on the outside/inside. Has been fine for many years. OMG Le Creuset. My MIL bought me a huge yellow LC dutch oven a few years ago as a gift and it. is. my. favorite! +1,000 I have an LC dutch oven, saute pan, and several casserole dishes. I bought mini-ramekins once too because they were at TJ Maxx, although all I use them for is prep! I have been fortunately to find my color at TJMaxx quite frequently and it’s always at the outlet. My dutch oven was a gift from my mother – thanks for starting the addiction! I am lusting after a LC kettle. I clean mine with soap, water, and a scrubby sponge. I ignore the light stains that have accumulated over many years of use. I have non-enameled cast iron too that is great for meats (although I no longer eat meat), scrambled eggs, and corn bread, among other things. So interesting — I have a 3 quart casserole thingy from Creuset that I never ever use. I use mine primarily for things like soup, sauces, ratatouille, chili, etc. My mom uses hers for braised meats and stews and the like. I can see how if you made things like that mostly in a slow cooker, you wouldn’t get too much use out of a Dutch oven. I have a handful of All Clad pots and a set of Walmart’s All Clad knock off brand, Tramontina. The All-Clads don’t seem that much better than the Tramontina, and cost about 3 times as much. On this note, does anyone have tips for cooking with stainless steel pans? We got a beautiful set of All-Clad for our wedding, but everything I’ve ever tried to cook in there has stuck to the pan horribly. Any advice? That’s just what happens with stainless steel. Use more oil. I tried that, but it made the food too oily to eat (and also isn’t very healthy). I guess I should just go back to non-stick pans. The key is to preheat. I use the water droplet test. I’ll link to it below. Agreed – preheating is key, as is not trying to move the food around until it’s ready to be flipped. If you’re cooking a chicken breast, it should release cleanly when you try to flip it. If it sticks, give it some time. Thirding the preheating. Pan has to be really hot. For eggs, I preheat, then use non-stick spray and my eggs never stick that way. Also, to help clean it if it does stick, Barkeeper’s Friend is amazing. Also, while the pan is still hot, I throw it in the sink with water and a bit of soap. That usually gets most of the gunk off and then its cool enough to wash after I’m done eating. This doesn’t warp the pan? Preheat pan, add oil, give it a minute to “sink in,” add food, let sit while cooking and don’t turn until that side is done, after cooking fill hot empty pan with water and leave on stove to sit until you wash dishes. I got a huge, deep ceramic frying pan for Christmas and it’s become my favourite kitchen thing. I hardly ever use my stainless steel anymore. A great resource for reviews of kitchen ware and other household essentials like sheets and comforters, laundry detergent and vacuum cleaners is the web site thesweethome dot com. They pull reviews from multiple sources and then do their own testing. Oooh thanks! This seems great! Thanks, that site is great. I have used their recommendations for many big purchases, washer/dryer, dishwasher when I first bought my condo. Very detailed reviews helping me pick these big ticket items all on my own ! Also used their reviews for kitchen appliance and electronics, never goes wrong. Also like that they give you the “best” at a higher price point and an affordable but good quality option to suit your budget accordingly. FYI, Calphalon will replace for free your nonstick pans if they are starting to show wear. Sari, how do you get Calphalon to replace it? I think I got mine at Williams-Sonoma but don’t have the receipt. Just send to them (I use regular mail) and they ship you back brand new pans. :) Make sure to state in the letter that no metal utensils, etc., were used on the pans. Yes! I have done this multiple times with my nonstick pans. I have an amazing saute pan from IKEA which I use for almost everything. Any lidded frying pan would work for most of what I use it for. I have one as well from IKEA that I use almost every day. It’s deep, probably 3″, with angled sides, sort of wok-like, but with a wide base. I’ve got the glass lid as well as the splatter shield. I love this pan. I also find myself using my Kitchen Aid stand mixer more than I thought I would. It’s just so easy to whip up a batch of something in that thing. Love it. I love my Kirkland Signature stainless steel pots/pans (Costco house brand) from a few years ago (tri ply copper core) so much that we didn’t register for stainless steel pans when we got married last year. My favorite nonstick have always been Tramontina. For a cast-iron skillet, I love my Lodge (although I would never cook eggs in it) and for dutch ovens, my husband and I went for the Staub over the Le Creuset and never looked back. For appliances, I inherited a countertop convection/toaster oven that fits an entire 9×13 pan (also good for small hams). I rue the day when it will finally kick the bucket, because they don’t make them that big anymore. I bought myself a KitchenAid stand mixer in law school and use it often. I used to use my Cuisinart food processor all of the time, but since I got a mandoline, I have been using that instead (fries, french onion soup, potato gratin). Also, if you like meatloaf, one of those fancy meatloaf double pans that drain are life-changing. I second the Kirkland stainless steel set! My mom has used them for at least a decade, with zero wear and tear. They look brand new (and she has used the set daily) and the price can’t be beat. We just bought a new house and I was dying to get a set of my own and finally did! They do have a bit of a learning curve from nonstick, but I only have these and cast iron pots and pans now. I also love my KitchenAid stand mixer, and will add my rice cooker to that. I don’t remember the brand – it’s a pretty large size and one of the fancier brands (either zojirushi or tiger). My mom is Asian so we always had a warm pot of rice at home growing up, and I have to have it still. I would like a larger food processor, I just have a small attachment that came with my stick blender. That’s next on my list! My Le Creuset Dutch oven, my Lodge cast iron skillet, my food processor, my slow cooker (best use of American Express points ever), and my Wusthof chef’s knife with sharpener. I do love my KitchenAid stand mixer but that feels like more of a luxury item. The Dutch oven and cast iron just make everything taste so, so much better, and I love my food processor for the luxury of homemade hummus or peanut butter at the push of a button. Finally, sharp knives are everything. I bring my sharpener when I go over to someone else’s house to cook! I like nonstick pans too, but I prefer anodized aluminum like Calphalon rather than the Teflon-coated ones. I also love beautiful bakeware (ramekins, casseroles, pie pans, etc.) and have discovered that thrift stores and yard sales are an AMAZING way to collect these. You can get gorgeous Corningware pieces, often in whole sets or with lids, for $5-10. Ditto for lovely glassware. I snagged the perfect set of 6 Don Draper-style rocks glasses for FREE at a swap meet. One trip through the dishwasher and they are now my favorite way to enjoy a gin or bourbon. When I got engaged, my cousin recommended registering for the Cuisinart Griddler. It is pretty awesome and everyone in my husband’s family now has one also. It has a griddle side which works great for paninis (and meat if you don’t have a grill) and a flat side which works great for pancakes and tortillas. And, bonus, you can put the trays in the dishwasher. Also, I really love my electric kettle. I just have a cheap one, Hamilton Beach from Target, but it is so convenient for heating water and I use it every morning to make pour over coffee. +1 for an electric kettle and French Press. Since getting married over the summer, I recently researched a bunch of items and got a bunch of new things over the past year. I’ve had my Kitchen Aid stand mixer for 10 years and still complete love it. We got a Vitamix that has been worth it’s weight in gold. We make a ton of smoothies and I’ve made soup in it and puréed peaches. So amazing and wish I’d have bought one years ago. My Cutco knife is the best one I own. The Chicago cutlery set we got is ok but not great. I really like my Cook’s Standard stainless steel pots and pans. I’ve learned to cook with it although it’s a little more complicated than nonstick. The only downside of what we got is that the lids aren’t glass. I wish I’d picked that set. The pots and pans themselves are great though. We also got a calphalon nonstick pan with a glass lid that is nice for my husband to use. He hasn’t gotten a hang of the stainless. I love my Nordic ware baking sheets and silpat liners. I have the Nordic ware baking pans with lids too but they look a little worn after storing apple crisp in them for several days. Some people are concerned with aluminum though so that’s something to be aware of. I love my Calphalon nonstick pans, which I got at Costco. KitchenAid stand mixer, of course. I have the grater/shredder attachment, which is amazing, and also the sausage grinder, which I got for free with purchase and which turns out to be perfect as a substitute for a potato ricer. I heart you for your reference to Alton Brown. KitchenAid stand mixer is key. I use my Le Crueset dutch ovens, skillets, or sauce pans probably 4 or 5 nights a week. I still have the same All-Clad stainless pans from my wedding over 10 years ago. For my birthday two years ago, my husband bought me a Bob Kramer knife and that has been a game-changer (also, my husband knows the key to my heart is through kitchen stuff). We have a trashcan that has a motion sensor on the lid and opens if you wave your hand over it. It is so helpful when your hands are full (or covered in raw chicken/raw meat goo) and really cuts down on cross contamination. I also love silicone spatulas way more than I should. And Oxo click tongs. And when I got married, someone gave me stone Emile Henry mixing bowls and I use those probably 4 days a week for something. Oh I’m crazy in love with my silicone spatulas that are all one piece. And the OKO tongs with silicone tips and the little click thing at the top to store them closed. I’ve had good luck and good quality with the LeCreuset outlets and with finding pieces at TJMaxx/HomeGoods/TuesdayMorning. You just can’t be picky about color. Yes and yes. I have a bunch of LC pots and I think the most I’ve paid is $100 for the big dutch oven. Makes everything taste better. I especially like it for soups and chili. My smaller one is great for pasta sauces. What do you use the dutch oven for? I want one because they are pretty, but don’t see an actual need. Soups, stews, deep frying, braising, slow-cooking, baking, roasts, sauces. How is it better than a stockpot? We have a KitchenAid stockpot that we use for these things. Although I agree with Anonymama that dutch ovens are prettier. The cast iron holds heat better, so it’s great for longer cooking of stews and meats. We just bought one at a store closing sale just before Christmas. To be honest, I now would have happily paid full price! If you like to cook stews or soup or braises or anything really that needs to sit awhile or go from stove to oven, they are amazing for that!! Also, the cleaning is super easy. We’ve only had to do soap and water with a sponge. So worth it! Mine has had frequent use since I bought it in 1990 and is still going strong. I don’t think there is any other kitchen item that has given me greater bang for the buck. I love my Chef’s Choice electric teakettle, which I got on amazon in 2011 and is still going strong being used daily. Second is the Cuisinart immersion blender which is life-changing. I still use my original Cuisinart food processor (circa 1988) for chopping onions or grinding breadcrumbs but use the stick blender whenever possible cause it’s just so darn easy and easily cleaned. I have a counter-top toaster oven that holds a full 9″ pie plate or 8″ square pan. It broils, toasts and bakes and I find I use it daily. Can’t remember the brand. Other favs are my Cuisinart programmable slow cooker (3.5 quarts which is small but it’s just two or occasionally three of us and it holds a 3.5-4 pound pot roast), Costco green non-stick pans and an all-clad piece or two purchased on sale. Just saw Costco’s house Kirkland brand all-clad set last week and plan to get that in the near future. I also love silicone spatulas out of proportion with their importance. Can I ask what everyone who uses their KitchenAid stand mixer all the time is using it for? As an avid baker I really want one but honestly I only have time to bake once a month or so and that’s an expensive gadget to use 12 times a year…I do cook all the time though so would love to think of other uses to justify it! I confess I don’t understand the allure of a KitchenAid at all. I am an avid baker too but for something like cookies, brownies or muffins, mixing by hand takes about 10 seconds and setting up and cleaning the KitchenAid would be way more work. I guess I can see how it’s worth it if you make bread from scratch, but I don’t. I bake about once a week, sometimes more. I’ve also banned pre-made whipped cream from our house since it’s so easy to whip up. So I use it weekly. This past weekend I made cinnamon rolls, chocolate chip cookies the week before that, and liege waffles several times over the past month. I can’t really think of any uses we have for it on the cooking side though. If you aren’t picky about color you can get a (refurbed) one on woot.com for $200 today. I use my kitchenaid for baking mostly, but also for shredding chicken (hot chicken shredds into perfect chicken salad! ), mashed potatoes, mixing meat for burgers… Really though, it is so great for making icing and cookies batter that is really stiff. Learning the shredded chicken trick has changed my world. I would never have thought to use it for those meaty purposes. I’m going to have to give that a try. OMG must shred some chicken ASAP! I adore mine as well, but I’ll admit that I don’t get to use it as often as I did pre-kids. I’d say that 90% of the time, it’s getting used for bread or pizza dough, other stiff doughs (cookies! ), or something that requires creaming butter and sugar. I usually use a whisk to whip cream, but I might use the mixer if I’m making it for a crowd. I think I have a recipe or two around that calls for you to use it on ground meat (potstickers, I think? ), but it’s definitely mostly for baking. I have a large kitchen, and I’ve had mine for 15 years, so it’s not really expensive with that in mind, but I’m not 100% sure that it’s a necessity if cost and space are at issue and you don’t bake often. It’s really great when you don’t remember to let the butter or cream cheese soften as much as you should, though. I don’t use ours all that often either, but it’s such a time-saver when I do! We got it as a wedding gift, not sure I would get my own money’s worth out of it, though. I don’t use ours all that often, but it is a real time-saver when I do! It was a wedding gift, though, not sure I’d pay full price for one on my own. And like others have said, you can get them for less expensive. Woot will have them occasionally, so will Tuesday Morning. As long as you aren’t picky about the color or model, you can get them for around $200. The ice cream bowl attachment is amazing (but eats up a lot of freezer space – a non-issue for us with a chest freezer but was very frustrating when I was in an apartment). I use the stand mixer to make homemade pizza dough, I make bread or homemade cinnamon rolls (yeast dough) once a month or so, and anything that requires creaming butter and sugar. Homemade whipped cream for the holidays, large batches of cookies around the holidays, cake batter for multiple layer cakes. I don’t use it as often now as I used to (something about a 60 hour week being a good week), but they will last 20+ years (my mother’s is still going strong). Definitely something you need to have the space for though unless you’re a serious baker. FYI, you used to be able to (at least I did) use the 20% off Bed Bath and Beyond coupon on them. That plus a manufacturer’s rebate brought it down to $200 for me in whatever color I wanted (Artisan model, silver). Shredding chicken is my favorite with my mixer! I put chicken that is warm or just done boiling in and put it on low to perfectly shred! Amazing time saver! Obviously also use it to make dough-y things – cookies, pizza crust dough, brownies, etc. What is the real deal about replacing nonstick cook wear? Is this real, or just fear mongering? What does “signs of wear” mean? I have a set we got for our wedding 16 years ago. We are still using it. We also have some pots from college (so about 20 years old). Does signs of wear mean scratches in the coating? If so, I see lots of those. Where does this concern about fear of toxins really rank in the world of things to be worried about (and in the list of things to spend money on)? Kat’s comment about replacing coated pots every year or two seems extremely wasteful to me. Think about the environmental impact of the trash, not to mention the manufacturing (and shipping) process. Pots seem much to substantial to replace that often. Are the rest of you doing that? If I decide to replace our pots with something that is NOT non stick, what do you recommend? Is this what Le Creuset is for? We have a roasting pan from the brand but nothing for the stovetop. As for things I love: I have a chef’s pan that we use all the time. It’s a great size and shape for making so many different things from stir fry to stews to sauces, etc. I also love our Cuisinart food processor. I have read several articles about the negative impact of teflon or similar nonstick coating if it gets in the food, which is a concern if there are any scratches at all – so that is why I return the pans and get new ones. The off-gassing from pans containing PFOA kills pet birds and DuPont has a long and sordid history of covering up the environmental and health concerns related to the chemical. Not something I want in my kitchen when there are non-toxic alternatives readily available. Not really concerned about the health effects of nonstick, but if you dont buy great nonstick pans or you put them in the dishwasher or any number of things, the nonstick coating wears off really quickly. I had one in college for 4 years that definitely should have been replaced after two as the bottom got all warped. On the other hand, we had All Clad ones that someone put in the dishwasher or something and completely ruined the coating and they were at that point less nonstick than the regular stainless steel ones. Also, you need to treat the nonstick pans just right — never ever ever spray them, and don’t use metal on them. When I got some nice pans for my wedding, my mom gave me all sorts of advice that I wrote down. Perhaps the biggest thing was that I should only ever use a silver metal spatula on a silver metal pan. Never use metal spatulas or other utensils on a pan unless it’s shiny metal. Rubber can be used on anything. My husband isn’t great about remembering that, so I just keep the rubber utensils out on a utensil jar, and tuck away all the metal stuff so that it isn’t go- to. Ceramic, stainless steel, or cast iron. They’re heavier, but it’s worth it for something non-toxic that cooks well. It’s not like the toxic versions are light as a feather themselves. Agreed. And heavier tends to equal more even heating, as well. And less likely to lose heat once you put food in the pan. Costco’s Kirkland Signature brand has an amazing stainless steel pot and pan set. The price for the value is fantastic! I haven’t seen a rice cooker mentioned! We got a Zojirushi one and I use it at least once a week! You can cook any kind of grain in it (I do rice, barley, quinoa, blends) and has a few different settings. You can also set it up on a timer, which is nice. Plus it plays cute little songs when it starts and when it finishes. I cannot wait to get one of these soon to replace my sad, dying rice cooker. Zojirushi is the absolute best and it keeps cooked rice good even the next day. 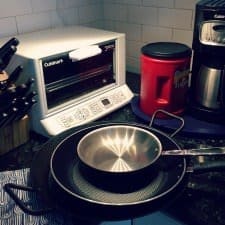 In addition to what everyone else said (my Le Creuset dutch oven is my favorite thing), I want to give a shout-out to Scanpan nonstick pans. I started with a small one for eggs, and then got an 11-inch skillet. Things will actually brown in them, unlike regular non-stick, and it’s safe to use metal utensils with them. I hardly ever reach for my beloved cast iron skillet anymore. I’m all over this thread, but I cook dinner at least 6 nights a week – so my kitchen stuff gets heavy use. I received a Scanpan for Christmas last year and it was the best non-stick skillet I’ve ever used. I asked for the braising pan this year for Christmas and I use them ALL THE time. Best non-stick ever, but I would never be able to buy them for myself because they’re more expensive than most non-stick pans. Le Creuset dutch ovens – makes everything you cook taste better. Food processor – love it, worth the cabinet space but my big one finally broke; just bought a small 3 cup one – will see if it’s good enough to make sauces, chop nuts, etc. Cuisinart griddler – have and love this, but hardly use it b/c I hate cleaning it and it takes up too much counter space. I think I’d like it more if I didn’t have such a tiny kitchen. Breville toaster – received as a gift, nice, love the “a bit more” button, but not sure if it’s so much better than a regular toaster. Potato Ricer – makes the *best* mashed potatoes but I don’t eat nearly enough mashed potatoes for this to be worth the space. Lovely for impressing family at holiday time though (which is really why I bought it). Immersion blender. Never got the hang of it. Expensive knives. I find keeping my knives sharp is what matters. Oh, and I nearly forgot my most favorite recent purchase! I saw these in Barnes and Noble of all places, but the Joseph Joseph nest storage tupperware is absolutely amazing, especially if you don’t have a ton of cabinet space to devote to random tupperware pots. I got rid of almost all my other containers and this just makes me so happy when I open my cabinet (whether I’m using them or just not having a container randomly fall on my head as I am putting away other dishes). Seriously can’t recommend highly enough. My favorite kitchen item is my Delta touchless faucet. We bought and installed it (it’s a tough job for a experienced person … we do our own renovations so after 30 years I could install it but even then it was tricky). It is simply wonderful. We got it when they were running the initial commercials of “Your Hands Can Do So Many Many Things.” I love it. When I’m at the sink in my office suite, I often find myself touching the faucet, expecting the water to turn on. What can I say … creature of habit. It also turns off after four minutes – if you have kids that let the water run. The spray pull out has really good magnets in it. After that, I think it’s my silpats for baking cookies, cheesecake cookbook (followed by an old better homes and gardens plaid one, and King Arthur Flour). We have a big cephalon pan that I bought for making pommes annes, but over the years, we have just started braising meat in it on the weekend – to have protein to last the week through). For slicing through big cuts of meat, we have been loving our Bubba Blade knife. I know, it’s weird, but is cuts through like “buttah.” I think it’s their 9″ fillet knife. Good for just about anything, including doing a fish fillet, it’s original use. I have both a Lodge enamelware dutch oven and a Le Creuset – I use them interchangeably and love both. They’re holding up equally well, and use them often. They are different sizes. I clean them both with hot sudsy water and every now and then use a paste of kosher salt, baking soda, and a little hot water or white vinegar when they get kind of stained. I also have some cast iron that I inherited from my great grandmother – I use the larger skillet daily. I clean it with kosher salt and then wipe it down with a bit of oil after most uses, although sometimes a bit of hot water and elbow grease is necessary. I also use my kitchenaid mixer and our toaster oven often. But the true rock star of my kitchen is probably that large cast iron skillet that my grandpa gave me after he put his mom in a nursing home. I like to think about how many meals she cooked in it when I use it. I have no idea how old it is, but I’m sure it’s seen lots of hearty meals. I really like my Santoku knife, and even my kitchenaid cutting board. I use my Magic Bullet all the time – so great to make an easy smoothie whenever – and I also really like my Nespresso machine. The toaster oven is definitely a must – I use it all the time for baking fish and chicken. I’m always on the lookout for a good, light, wide-bottomed wok with lid with nonstick coating. I always struggle with finding sufficiently light pots and pans, and ones that are compatible with my stove. More recently got a CrockPot and am loving it and looking forward to making more dishes with it, especially easy dinners. Our All-Clad slow cooker (6 quarts! warming feature!) is my favorite thing in our home. We use it at least twice a week. I never use my mixer (though the attachments for meat grinding saw some use). No food processor even though I kind of love them, because I hate cleaning them. I’ve gone through so many broken blenders (the BLADE flew out of one of them!) that I finally succumbed and bought a refurbished Blendtec (can’t even remember why I chose it over Vitamix; it was close). I was skeptical that it would last any longer, but it’s done all right so far, and definitely blends better than cheap ones. I have a manual spiralizer and use it in the summer (zucchini noodles! ); it sits around in the winter. I have a slow cooker. It’s easy to overcook things in it, and hard to get that perfect two-four hour window of cooking time that it seems to like. But it does soften tough cuts of meat (or even tendon), and I’ve found some good recipes (Ethiopian okra stew is amazing). My favorite kitchen thing is my kitchen scale (mine’s brand is EatSmart). I use it for baking (no fussing with measuring cups and spoons! ), following recipes in general, and for pour over coffee that’s just right. And, as the tacky brand name attests, it is also good for portion control. Second place goes to my Simple Human trash bins. I’m not convinced that there isn’t a cheaper alternative to the floor model, but the under sink model was not that expensive, and it Just Works Perfectly. Makes me feel good about manufacture and design every darn time I use it. Looking for a garlic press (I don’t want the garlic to be completely pulverized, just pushed out of its skin and minced; my last one was Kitchen Aide, and the handle broke right off in my hand, sigh). Well-seasoned cast iron is much more non-stick than a non-stick pan; it’s the best thing to fry an egg in! That said, my “pre-seasoned” pan isn’t even close to the ones I grew up with, and I haven’t put in the effort to season it for real (probably doesn’t help how often I use it for acid foods like chili). I don’t use non-stick because of birds (though I bet a lot of cooking is bad for air quality). My pots and pans are Macy’s Belgique, because they are not too heavy, and not too light, and they all have adorable pot bellies that make me love them. Toaster ovens are amazing, but how do you keep them clean? I love my two Scan Pans. They are non-stick but can withstand 500 degrees. I bought a Sous Vide from Costco for my boyfriend for Christmas. He uses it weekly, and has used it to cook some tasty beef and chicken. It cooks everything evenly. I also love the Vitamix I bought through the classifieds at work for $100. Have seen some on eBay similarly priced. Nobody mentioned the Instant Pot? I bought one during Black Friday and use it several times a week. I could never get the hang on the slow cooker and hated the thought of food cooking all day. Now I prep my meals the night before and throw everything in the IP as soon as I get home and have dinner ready in less than 1 hour. I also love our Zojirushi rice cooker (with time delay) and my Bodum French press. Love the recommendations for pots and pans. I’ve been slowly upgrading our non-stick Caphalon set to stainless steel and have been wanting to try cast iron for a while.